Historical introduction. Mathematical Methods in Economics. Mathematical analysis and convexity, with applications to economics (J. Green, W.P. Heller). Mathematical programming, with applications to economics (M.D. Intriligator). Dynamical systems, with applications to economics (H.R. Varian). Control theory, with applications to economics (D. Kendrick). Measure theory with applications to economics (A.P. Kirman). The economics of uncertainty: Selected topics and probabilistic methods (S.A. Lippman, J.J. McCall). Game theory models and methods in political economy (M. Shubik). Global analysis and economics (S. Smale). The Handbook of Mathematical Economics aims to provide a definitive source, reference, and teaching supplement for the field of mathematical economics. It surveys, as of the late 1970's the state of the art of mathematical economics. This is a constantly developing field and all authors were invited to review and to appraise the current status and recent developments in their presentations. 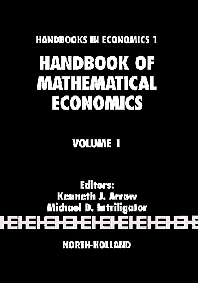 In addition to its use as a reference, it is intended that this Handbook will assist researchers and students working in one branch of mathematical economics to become acquainted with other branches of this field. Volume 1 deals with Mathematical Methods in Economics, including reviews of the concepts and techniques that have been most useful for the mathematical development of economic theory. All in all this is an excellent set of surveys which any institution with a serious graduate programme will want to have in their library. @source:Economic Journal @qu:All of the surveys in this book are written by recognized leaders in their respective areas of mathematical economics... The editors of the Handbook have been remarkably successful in recruiting distinguished authors and in including them to write careful and detailed surveys. @source:Journal of the American Statistical Association @qu:Judging from the quality of this Handbook, the publisher and the Editors are to be praised for an impressive start, and the reader can expect more good stuff to come. This set of books are the utmost authoritative reference of the foundation of economic theory. It collects all the important results, many of which are still covered in first year PhD economic theory textbooks.